Remember the old Landmark Books you lapped up as a kid like Abe Lincoln: Log Cabin to White House? 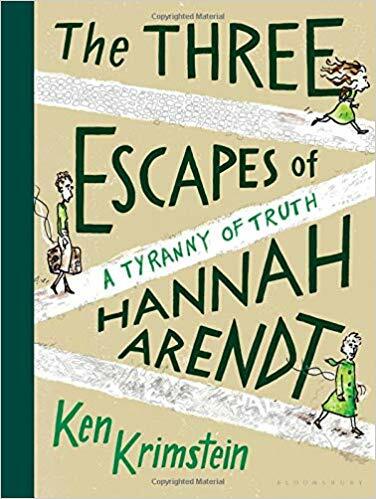 Now adults are getting to read their favorite intellectual heroes in illustrated bios. Of course the idea of taking serious subject matter and portraying it in comic book or graphic novel form began with Art Spiegelman’s Maus. However, this latest trend suggests all kinds of unique possibilities for turning profundity into the little cartoon bubbles. Ann Frank would be a good starter and then there's Simone Weil and naturally Sylvia Plath. Of tragic male figures why not start with the tormented Paul Celan, whose poetry dealt with the Holocaust. Then if you’re looking to cruise the world of philosophy, how about Wittgenstein sitting cross-legged with his fellow Cambridge dons and musing “that whereof we cannot speak, thereof we must remain silent,” the final precept of the Tractatus Logico-Philosophicus? But lo you may find yourself beaten to the punch by a recent release. 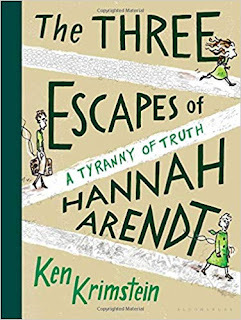 “Hannah Arendt was obsessed with the dangers of thoughtlessness…” writes Becca Rothfeld in her TLS review (“Making a mess, How to turn a thinker into a caricature,” 1/4/19) “How would Arendt feel, then, about the facile lionization she faces in The Three Escapes of Hannah Arendt: A Tyranny of Truth, a graphic biography by the cartoonist Ken Krimstein?” Well one thing's for sure, Krimstein may be criticized for trivializing, but no one will dare to call him banal.